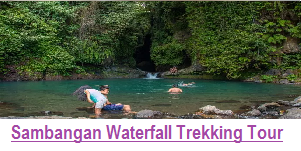 Bali sunrise trekking is one of the best trekking program in Bali that we managed, that you can do during your holiday if you one of Nature Lover and Adventure Lover , this trek is very awesome and will make your holiday be the best experience. 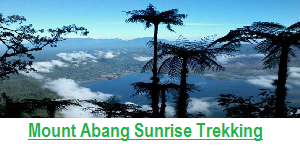 The trek begin at 4 am, here you will climbing the most beautiful sacred Mount in Bali, named Mount Batur, from the top of the mountain you will see amazing sunrise, and beautiful view of the lake plus Kintamani village. Beside that you also steam an egg at the top of the mountain with very unique way. 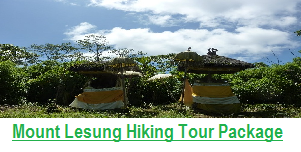 We are as a Bali Trekking Organizer will be very happy to organize this amazing Bali sunrise trekking for you, we will pick you up from your hotel where you are staying in the early morning at around 2 am, we also prepare Balinese Power breakfast for you, because we really know that you will need Good power for Climbing mount Batur. 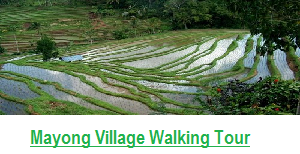 after the trek finish we will take you back to your hotel by passing some interesting places such as Tegalalang Rice Field, Elephant Cave, and we Also will offer you with reasonable price with our best service that we have. 11:30-12.30: Drive back to your hotel. 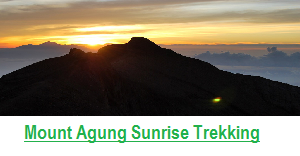 “We did have a very wonderful time during Sunrise Trek to Beautiful Bali Volcano. 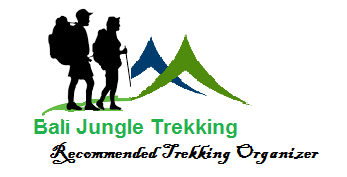 The guides and driver from Bali Jungle Trekking are very helpful and considerate. The local guide was very helpful, knowledgeable and experienced. The community provided all our needs for hiking up the mountain such as breakfast, sugary snacks, spot lights, etc. The guides and driver were also very punctual and energetic. All of these even made our trekking trip more enjoyable and memorable. This natural Lake which is formed from passed eruptions has the shape of a blue crescent and has Mount Batur as a combination to the wonderful back ground and is complete with black rocks that stretch like a paradise. 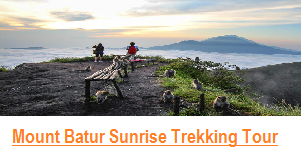 At the viewing spots in Kintamani, be prepared for the temperature which is cool at about 18 degrees Celsius. There are a number of restaurants in Kintamani that serve traditional, Asian, as well as western cuisines. Traditional eateries called “warung” are also situated along the main road in Kintamani overlooking the Lake and Mount Batur Volcano. Having lunch in Kintamani while enjoying the natural magnificence of Batur will be an amazing experience for tourists, photographers, and nature lovers.